Nepal is famous worldwide for adventure sports and hiking in Himalayas of Nepal. Every year hundreds of thousands of people travel to Nepal. Most of them are for trekking to the base camp of Mt. Everest from south face, the highest mountain in the world! 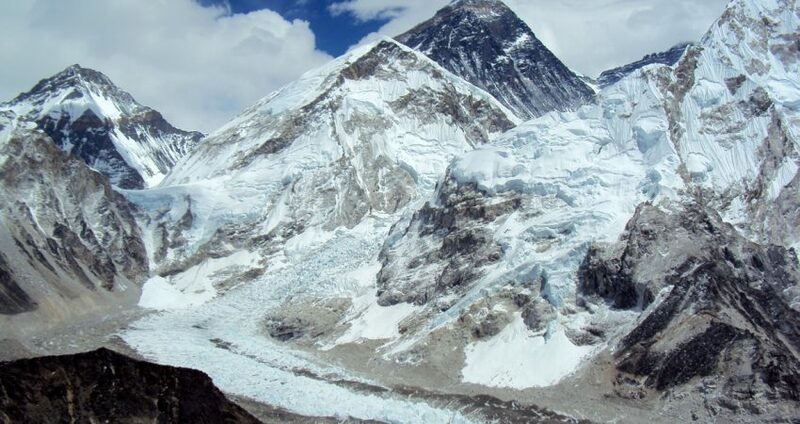 I’m going to delve into this guide to Everest base camp trek options and FAQ. Nestling amidst the peak of the highest mountain in the world, the Everest Base Camp Trek is one of the most popular trekking destinations in the world. More than 40,000 people from all over the world walk the trek every year. It is one of the earliest opened trials for foreigners. Ever since the successful expedition of Sir Edmund Hillary and Tenzing Norgay Sherpa in the year 1953, the route has been every adventurer’s dream. The sight of several peaks that you will encounter in this journey will leave you awestruck. Apart from the highest peak in worlds – Mt.Everest (8848m), you will also see Mt Lhotse (8516m), Mt. Nuptse (7855m), Mt. Pumori (7161m), Mt. Changaste (7550m), Mt. Lingterin (6679m), Mt. Amadablam (6856m), Mt. Thamserku(6723m), Mt. Kantega( 6685m), Mt.Kusum Khagaru (6367m), Mt.Kongde (6011m), Mt. Khumbila(5761m) , Mt. Twache peak (6367m), Mt. Cholaste (6335m) ,Island peak(6179m), Lobuche peak(6145m), Pokalde peak (5806m), Honku south peak (6119m) and many more. The trek lies in the Everest Region that is the second best trekking region of Nepal. The region is rich in its composition of flora and Fauna. The walk through the green hills, rhododendron forest, elegant waterfalls, graceful rivers, glacier lakes and Kala Patthar is a phenomenal experience all together. The region also houses the Sagarmatha National Park, which is listed under UNESCO world heritage site. It is home to several rare and endangered species. You might as well get to encounter some of the exclusive wildlife inhabitants on your way. Everest region is also draped with a unique culture of one of its kind. Most of the people living in this region belong to the Sherpa community whose lifestyle and tradition resembles to that of the Tibetans. These people are known for their friendliness and open-mindedness. Before you visit a place, it is always better to have a clear idea about it. This will help you overcome avoidable circumstances. This article is a detail guide of the Everest Base Camp trek so that you can have pleasant journey to the Himalayas. An alternative route is via Jiri to Everest Base Camp Trek, if you want to avoid flying to Lukla. • Start exercising about 4-6 weeks before the trek. • Do Cardio exercises like running, walking, swimming or cycling. • Carry a backpack while doing cardio exercises. • Strengthen your muscles by doing squats, pull-ups, pushups, dead lifts, etc. • Avoid over-exercising. The aim is to increase physical stamina and lung capacity. You will need several equipment for the trek. The below is a generous list and you may include or avoid according to your needs. You will also need the following during the trek. • Not all the items from the checklist is a must. You can use your own judgment to make your buying decision. • You footwear has to be very comfortable and durable. Shoe bites and blisters can ruin the experience for you. The boots should be lightweight trekking boots. Insure that the fabric is good and waterproof. • Purchase a pair of gaiters to keep your legs warmer. • Dress in layers so that you can regulate your body temperature as and when required. You can alter the combination of the clothes according to the prevailing weather condition. • Your clothes should be lightweight and especially designed for trekking. • Carry along a waterproof shell outerwear, jacket and pants. • Keep your hands, head and body as warm as possible. The Everest region is not restricted and hence requires no permit to trek in. If you are looking forward to enter the Sagarmatha National Park then you will have to pay permit fees. Trekking to high altitudes can result in various risks concerning health. You can easily fall a victim of minor or major injury. The cause of it can be a natural calamity or a careless step. You also might catch common cold, viral fever or have muscles aches. The most important health issues you need to be aware of before trekking to EBC are below. This is a kind of illness that is caused by ascent to high altitudes. The symptoms will occur within 6 to 24 hours of achieving a high altitude. Altitude sickness is fatal and can result in death if not treated in time. You need to stay alert to any of the symptoms that occur. If you see no improvement in your health within 48 hours, you will have to be immediately deported to the city for medical support. During times of emergencies like acute altitude sickness or a natural calamity, you might have to be immediately deported in a helicopter. The cost of such deportation is covered by health insurance that needs to be purchased before you start the trek. Consult any travel agency regarding the purchase of insurance. They should guide you through it. Make sure you do not start the trek without it. There are several ways in which you can trek to EBC. There is no law to travel with a guide. But it is highly recommended that you do. Guides are people who have a good knowledge and experience about trekking. They will guide you through navigation, suggest you the best place places to stay and eat at, and help you with price negotiations. The guide will also help you during time of emergencies. Before hiring a guide, make sure that he or she is licensed. A porter is someone who will carry your baggage for you making your journey more comfortable and enjoyable. Nowadays Guide-porter is also available. These are people who earlier worked as a porter and are close to becoming a certified guide. Hiring a guide-porter will save you from extra expenses. The best time of the year to trek to EBC is September to December (autumn) and March to May (Spring). During these months, the weather is pleasant for you to enjoy long walks. There will be very little or no rainfall. The rhododendron forest will be blossoming with flowers especially in the month of May. The skies are very clear allowing you to get the best view of the white Himalayan ranges. You might have many questions about Everest Base Camp. So I have also included some frequently asked questions. There are many foods in Nepal that you can try. You will be eating in teahouses. Almost all the teahouses have the same menu. For breakfast, you can have eggs cooked in your preferred style, bread-butter-jam, pancakes, sprouted beans and many more. For meals, you can have momo’s, pasta, noodles and various other dishes. The most preferred dish is Dal-Bhaat-Tarkari. Rice is served with vegetable curry, lentil, chutney, salad and meat cooked in Nepali style. You will not be charged extra for taking extra serving of anything but meat. Is drinking water easily available? Yes, drinking water is available. But as you go higher, the cost of water will rise up to 1$ per liters. Carry spare water bottle with you and get them filled in teahouses. The teahouses will sell boiled water for a relatively cheaper rate. How much money should I bring along with me to the trek? Depend only on cash and not on ATM card. Withdraw all the cash in Kathmandu city itself. Carry along at least 600-700$ cash. If you are on a luxury trek you will need 1800-2000$ cash. The mentioned amount is an overestimation of the actual cost. Accommodation is available at a cost of 3-4$ per night. A meal should not cost you more than 3$. You might need extra money to buy water, charge your electric devices, tip your guide and porter or pay for their basic need, and buy medicines. It is always better to carry some extra money with you. Do not expect luxurious accommodation. You will be spending your nights in teahouses or tented camps, as you want. The rooms are very simple but comfortable to sleep off the tiredness. Some place will have squatting toilets. While in some guesthouses, you might as well have to share the restroom with other guests. Where can I buy the trekking equipment? You can buy equipment from your hometown or Nepal. Nepal had many stores you can buy them from. You will find branded as well as local stores selling trekking gears. The most popular place to shop for them is Thamel situated in Kathmandu. You can also rent most of the items if you want. Can I carry my electronic devices? Yes, you can carry your electrical devices and it is absolutely safe. But buy an insulating cover to protect them from extreme change in temperature and pressure. Carry as many spare batteries as you can for your camera because Nepal has extreme electricity shortage problem. In higher altitudes, the supply is even lesser. The teahouses will allow you to charge your devices only at a certain cost. Can I trek solo during the EBC ? You can trek to EBC alone. The route is pretty easy and straightforward. Quite a lot of people trek solo – without a guide or porter or trekking company. However, trekking solo is not advisable when it comes to your safety. Trekking is an adventure sport that involves risks and uncertainties. You never know when you might need help. It is always better to stay on the safer side. How to find myself a trekking partner? What is so different about travelling with a trekking agency? There are innumerable trekking agencies in Nepal for you to choose from. Before you decide to travel with one, insure that they are registered and are reliable. Internet can be a valuable tool for you to evaluate them. In general, a trekking agency will plan your entire trip right from transferring you your hotel from the airport to leaving you off after the trek for your next flight. The team will consist of guides and porter hired by these companies. All you needs will be tended to throughout your trek. Specifically speaking, the agencies will have few services different from one another. But overall, all of them provide pretty much the same facilities and services, the difference being in the cost and quality of it. Is there anything else I need to know before I plan the trek? Always plan extra days than the number of days the trek will cost you. The weather in unreliable and the flights can get delayed or cancelled. You also might confront natural calamity because of which you might get stuck in a particular place for long. Sometimes, the weather in some area might be unfavorable for you to travel and hence you might have to halt for an extra day. You can fall sick. Considering all these possibilities, do not book a flight back to your next destination that is scheduled immediately after the last day of the trek.